ACP stands for Aluminium Composite Panel. LDPE stands for Low Density Polyethylene. 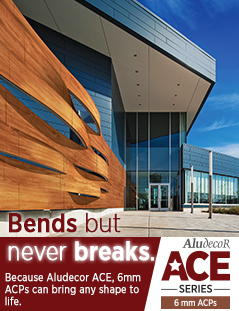 It is used as a core of Aluminium composite Panels. What are the components of ACP? What are the various thicknesses in which ACP is available? It is available in 4mm, 3mm and 1.5mm. 5mm and 6mm are available on request. What is the size of ACP? The width of Aludecor ACP is 1220 mm and length can be up to 6100 mm. Customized width of 965 mm is also available on request. 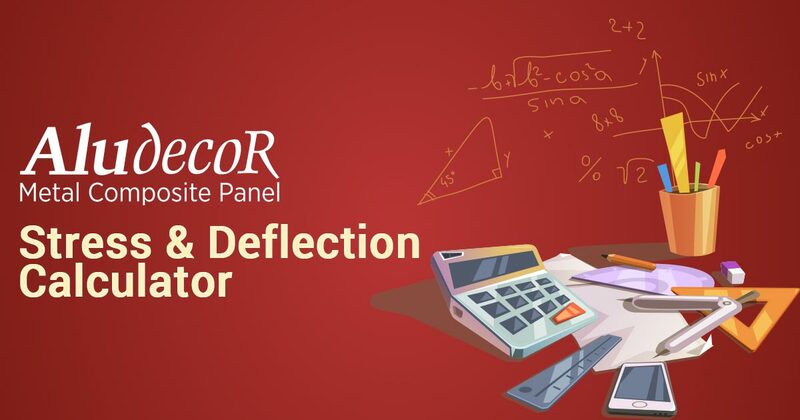 What is the thickness of paint on Aludecor ACP? From where do we source Aluminium Alloy? And who are our PVDF paint suppliers? 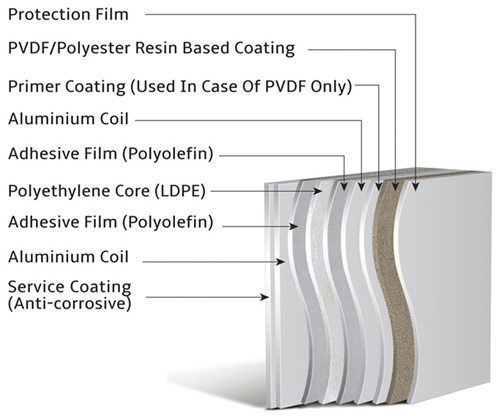 Which adhesive Film is used for bonding Aluminium with PE – Core? Dupont Adhesive of Bynel series is used as an Adhesive Film. What are the various tolerances of ACP? What is the use of ACP in construction? ACP as a product is used to enhance the aesthetics of a building. 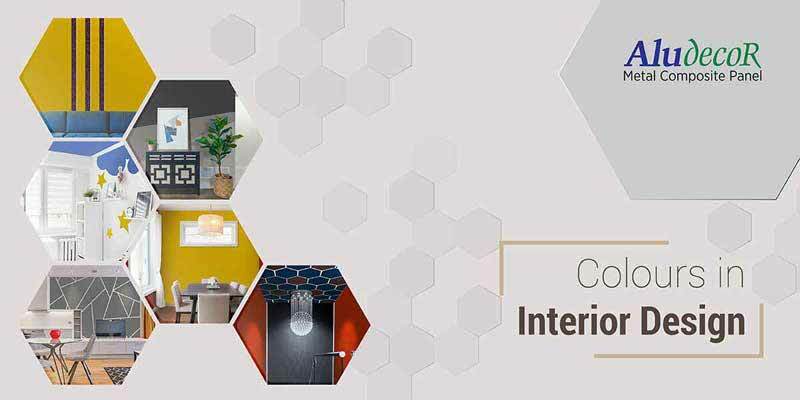 Its purpose is to give a well-defined, smart and a modern look. Are aluminium composite panels Fire Resistant? Aluminium composite panels are Fire resistant depending on the type of core material being used. Generally Mg(OH)2 is added as a non-combustible material. What are the fire classifications in your product? Aludecor has taken EN 13501-1 for flammability and reaction to fire, for resistance to fire on the complete system Aludecor has 2 hours ASTM E119 rating. These ratings are in comparison to BS 476, ASTM E84, NFPA, DIN 4102 etc. What are the grades of aluminium used in manufacturing ACP? AA 1100/AA 3003: The alloy of this grade is a manganese alloy which has a minimum tensile strength of 120 N/mm2 and to be used for buildings below 10 meters. AA 3005/ AA3105: the alloy of this grade is a magnesium and manganese alloy which has a minimum tensile strength of 150 N/mm2. This is to be used for external façade solutions as magnesium decreases the chances of oxidation of aluminium and the tensile strength enables it to handle wind loads of 2.25 KPa easily. AA 5005: this alloy has the magnesium content nearing to 1% which is required in coastal regions for not letting the aluminium oxidize and paint to sustain high salty moisture content. Also, it has the minimum tensile strength of 150 N/mm2 which enables it to handle wind loads of 2.25 KPa. What is tensile strength of metal and how it is expressed in units? Flexure means bending or bending strength of material. This is again calculated using bending strength formula. ASTM stands for American Society for Testing Material. Which types of coatings are used in coating aluminium composite panels? Which standard is followed in coating of Aluminium Coil for ACP? AAMA 2620/2605 is followed. AAMA stands for American Architectural Manufacturers Associations. What standard is used for measuring coating properties? What is PVDF and what are its properties? What is the difference between PVDF and Polyester? PVDF has a better weather resistance. 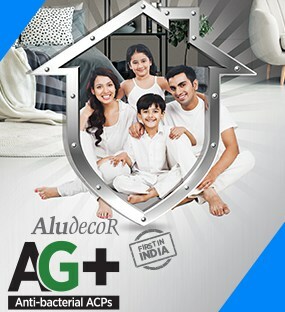 Is ACP scratch proof, especially interiors? It has a scratch resistance of up to 4H. How does the performance of paints differ with thickness? The performance of paint increases with an increased thickness under a stipulated range set by AAMA. Two coats PVDF has a durability of 10 years and by increasing it to three coats the durability increases by 5 to 10 years. Does weathering of paint depend on coil thickness? No, the paint weathering has nothing to do with the sub-surface. Why does the paint peel off from ACP? Why is the life of metallic colours lesser than solid colours?